As mentioned yesterday, a shorter version of this article is in the latest issue of Drink Me Magazine. For most, wine cocktails are what we drank while backpacking across Europe at 19 years old – before we knew better. No longer relegated to bottomless Bellini brunch specials and champagne cocktails served to octogenarian knitting circles in hotel bars, cocktails made with wine have been making a resurgence on the American bar scene. While cocktails crafted with wine may be viewed as an recent trend, the technique has a tradition reaching back centuries. Wine was often the alcohol in the original punch recipes (with sugar, water, fruit and tea) of British sailors in the 17th century. 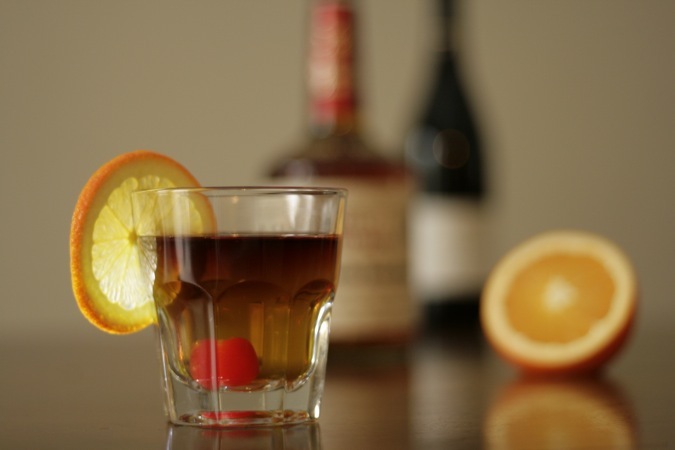 In fact, many prominent stories of the genesis of the word “cocktail” are rooted in the term first being used to refer to a drink that combined spirits and wine, either from the 19th century tail-cropping style used to designate a good horse of mixed-breed, or all the way back to the Revolutionary War, when American and French officers would pour back and forth between glasses in a show of solidarity, mixing the wines preferred by the French with the gin and whiskey of the locals. Near one such tavern, a rooster was stolen from a Tory and it’s feathers used to adorn their drinks, prompting the toast, “vive le cocktail.” American bartenders in the mid-nineteenth century, the golden age of cocktails, utilized wine in mixed drinks rather than waste the contents of bottles opened too long ago to be served, giving cocktails new character, but cocktails made with wine had fallen out of fashion again by the 1870s. As Pre-prohibition cocktails have been coming back into vogue, new wine cocktails have started showing up on the menus at elite cocktail bars across the country over the past couple years. When absinthe became readily available again stateside, Death in the Afternoon, a drink devised by Ernest Hemingway in 1935, as a jigger of absinthe dropped into a glass of champagne, became a favorite, but there are so many other superb wine cocktails lacking celebrity endorsement. The French 75 is a perennial classic, and newer wine-enhanced drinks have emerged, like the (there was supposed to be a drink from Reza at Conduit here, but they shuttered the restaurant while this article was being written) in San Francisco and the New York Sour at Schiller’s Liquor Bar, which takes a modern twist on the whiskey sour with a float of dry red wine. Simple reds and whites are less commonly utilized and have always been rarer cocktail components than sparkling wines like champagne and prosecco, late harvest dessert wines, and fortified wines like sherry, port and of course vermouth, the most commonly used wine in cocktails. Sparkling wines add effervescence to a cocktail without diluting it’s potency, while dessert wines and fortified wines have higher alcohol content, rivaling the potency of liqueurs while adding complexity to a drink. In creating wine cocktails, balance is key, requiring careful measurement. For contriving your own wine cocktails, start with recipes for your favorite classic cocktails and consider where wine can be substituted for an ingredient, or added to an existing cocktail to alter its profile. Start by substituting or adding wine one tablespoon at a time. You can look abroad for influences as well. Spaniards are famous for their sangria, but infamous for their calimocho and tinto de verano, red wine mixed with cola and lemon-lime soda respectively. When we accept that many spirits are simply wine distilled away from its water, it might be a little easier to accept such bastardizations. Nobody scoffs at a Singapore sling which is, in essence, only a step away from tinto de verano. Tip: like crafty bartenders of the 1860s, you can make the most out of wine that’s been sitting around too long by making a wine syrup the same way you make simple syrup. Combine equal parts (by volume) leftover red or white wine and sugar in a sauce pan. Over medium heat, bring to a boil, while stirring, just long enough to dissolve the sugar, or longer for more intense flavors. Try substituting this for a fortified wine or liqueur in one of your favorite cocktail recipes for something innovative and new.